I found this at work in some basement storage area. No cable just the board by itself. I opened it up to see how it looked on the inside. Some of the rivets were already missing, about half of the ones left I was very easily able to break them off with my thumbnail. As careful as I tried to be in the process of separating the barrel support from the steel back plate this happened. I went through with the cleaning process anyway and he next row over had started as well. Here's the break on the other side. This is my second bolt mod. My first was a success and I still use the board here and there. This support is a bit brittle and where it broke I wonder how much it will affect that row of keys. Before I took it apart it had a fairly clean solid sound for its condition. The membranes are in surprisingly good condition short of some calcium deposits on them. The keys and housing after a cleaning are in excellent condition as well. Based on that cracked barrel support and the rust on the controller, is this saveable? Any tips on removing the rust? How about fixing or still using this support? If no to either of these, what are my replacement options? I believe unicomp still sells the barrel frame, shoot them an email about it. Well, I'd love to take that off your hands for less than market price for an as is SSK, but great news for you: Unicomp sells replacement barrel plates. They call them "chimneys" I believe, instead of barrels, like most people I've seen. If the membranes are damaged, you will have to repair that yourself or give it to someone else to repair it for you because Unicomp does not make them anymore. For the controller, make sure the parts don't electrically connect with other parts that they shouldn't. I.E. scrape off the rust as best as you can and try it out. Edit: while you are at it, buy some new springs (and hammers) as Unicomp sells those too (only together with the hammers IIRC) and yours are likely shot from corrosion. 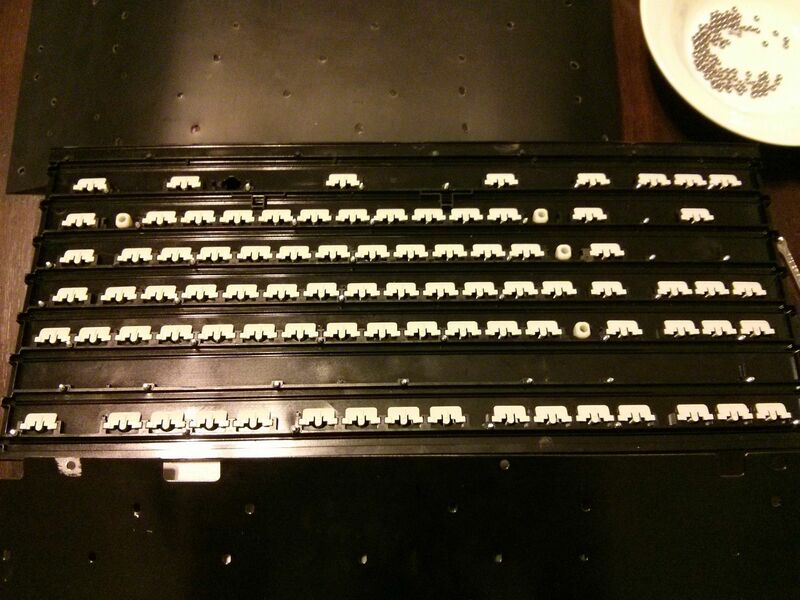 I don't think Unicomp sells the barrel plates anymore for the TKL's as I just asked them about it. However you could easily cut a plate down from a full sized 103 plate. Huh. Interesting. I thought they just recently added a listing for SSK barrel plates (I'm either mistaken or they went quickly!). I'd recommend cutting down a 101 barrel plate, instead of a 103 plate. 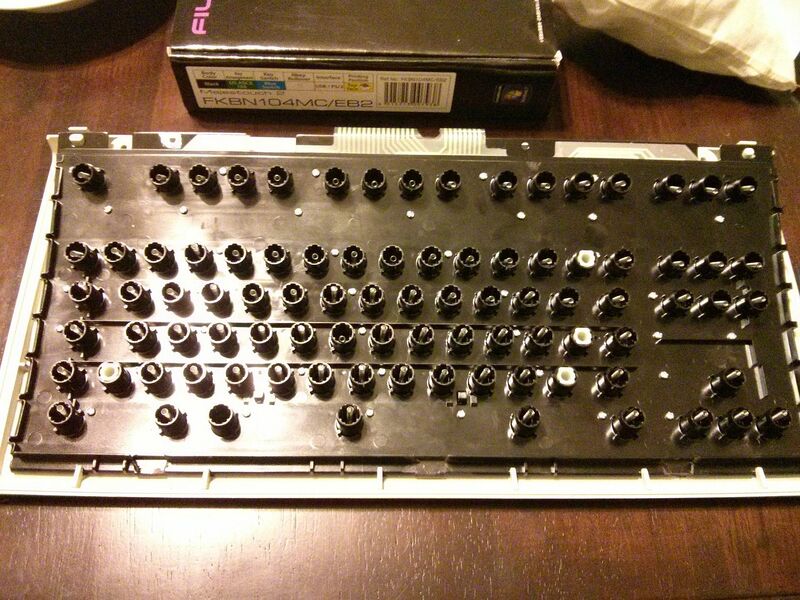 Unicomp's 103 key keyboards have windows/meta keys that won't correspond correctly to your SSK's case and membrane. Edit: Unicomp doesn't sell a 103 key version. Wildcard probably was referring to the ISO layout of the 101 key (ANSI) layout. They use the same barrel plate, which, to my knowledge will be the 101 key barrel plate. Yep that's it, I knew off the top of my head one of the plates had a similar layout but was a full size. This should work. 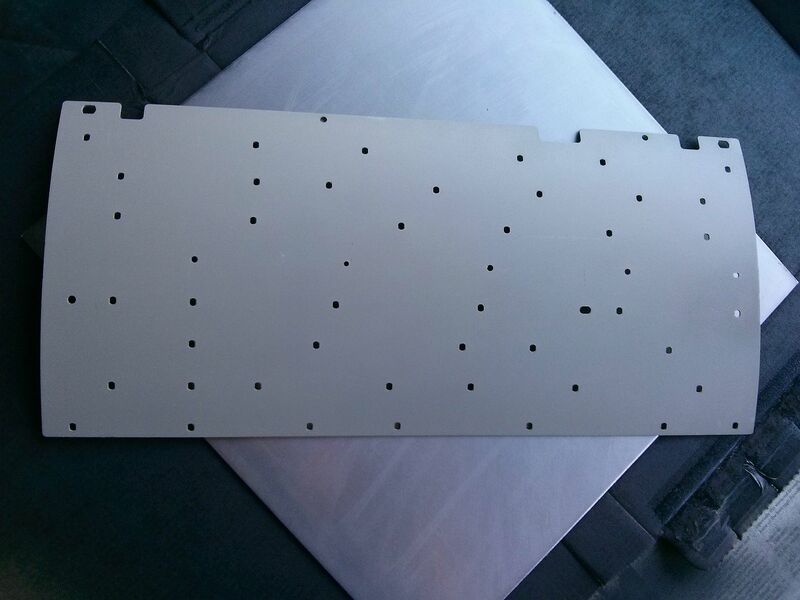 Where is this plate listed on Unicomp? I'm not seeing it or it's listed by another name I'm not putting together. Hammers and springs look good and clean except three of them. Where the spring meets the hammer it is corroded with rust, not just on the surface I can clean away. Might still just replace them all anyway. Cleaned the rust up on the controller and also cleaned the membranes. After looking at them closer some of the traces were a little dark but they all cleaned up pretty decent. The calcium, or at least I think that's what it was, rubbed away rather effortlessly, possibly sugar from soda or similar? No idea there but it's gone. Half assembled the board with the controller and steel plate in the housing and laid the membrane on and plugged it in and tapped around in notepad and everything was working well. Regular presses, shift and alt presses as well as function layer. Low Voltage installer. Mostly data, phone and fiber networks. I end up in a lot of odd places in the buildings I work in sometimes and come across all manner of things from keyboards like this to hand tools. Here there is an old BS type-writer I found as well. Some places just never throw stuff away. It gets shuffled around until someone like myself shows up, finds it and asks, "Can I have this?" Maybe I should start taking pics of stuff I find and can have and see if anyone here wants it. Guys, Unicomp has had SSK cases and barrel frames ("chimneys" in unicomp lingo) for a while. 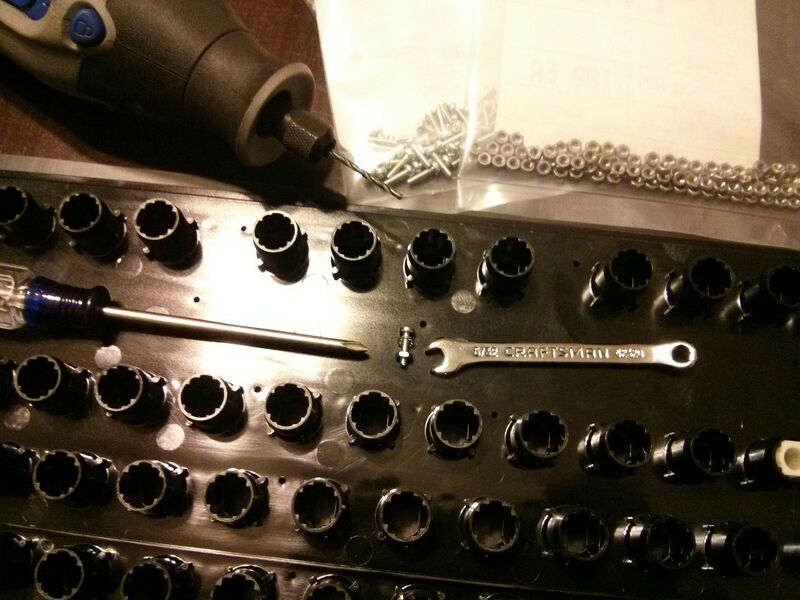 I actually ordered this part in June, when I was restoring CPTbadass's SSK. edit: there's a good chance that they added it to their website because of my order. I suspect you need to send them an e-mail for the barrel plate. You might as well ask about the SSK plates. It's better to ask and get lucky than to not ask at all. If they don't have any SSK barrel/chimney plates, you can order the 101 barrel plate from them via e-mail. I'm not sure how they charge you, but I know others have done it this way. * see the edit. So, it looks like you have a working SSK! 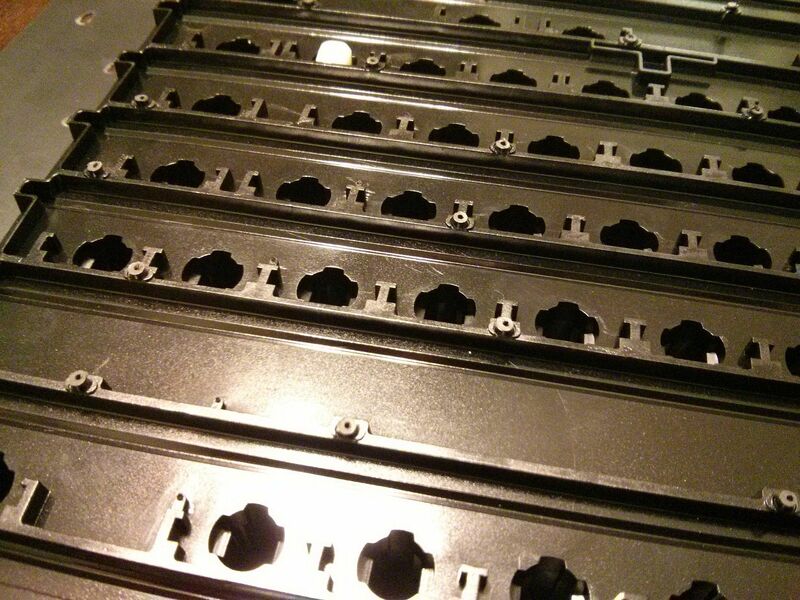 I've seen people glue broken plates together again by adding some structural support, but that isn't always reliable (bad keypresses, re-breaking, etc). Buying a new plate is definitely the best option, even if you have to cut down a 101's. Be sure to post pics when it's done! I love comparing before and after pictures on projects like this. *Edit: this might be it: http://pckeyboard.com/page/Misc/CVSET I think "frame" is what you are looking for. If it is, the 84 key is just what you need, no cutting! I'd throw Unicomp an e-mail to confirm this first, just to make sure you don't order the wrong part. Awesome! Thank you so much! I saw that before and just saw Cover Set and didn't think anything of it. I've been taking pictures here and there and forgetting to sometimes in rushes of excitement. Always pics when I remember and will update for sure whether I get it working or not. 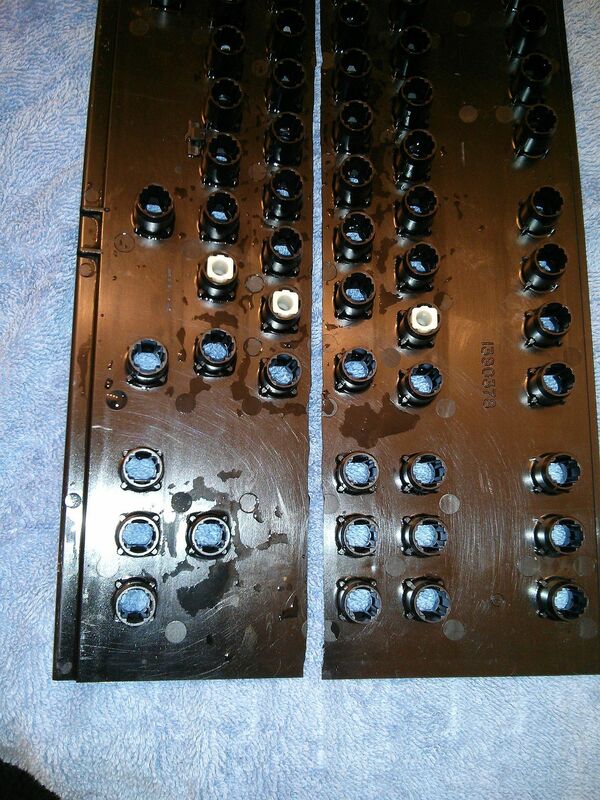 Here's a very large before/after picture of a couple of the keys after a warm water and soap rub down. 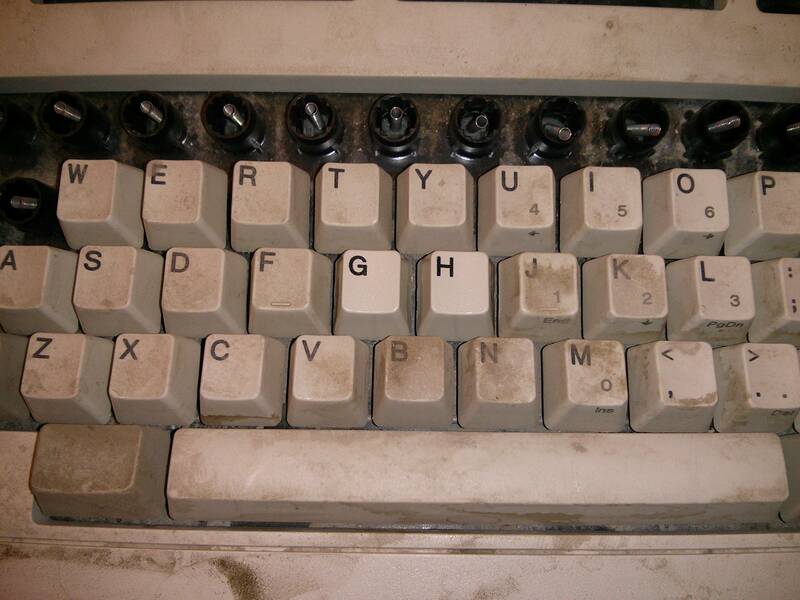 All the keys are in that condition. I'm pretty excited with this find and hopefully I can save it. If you order that barrel plate, this is as good as saved. 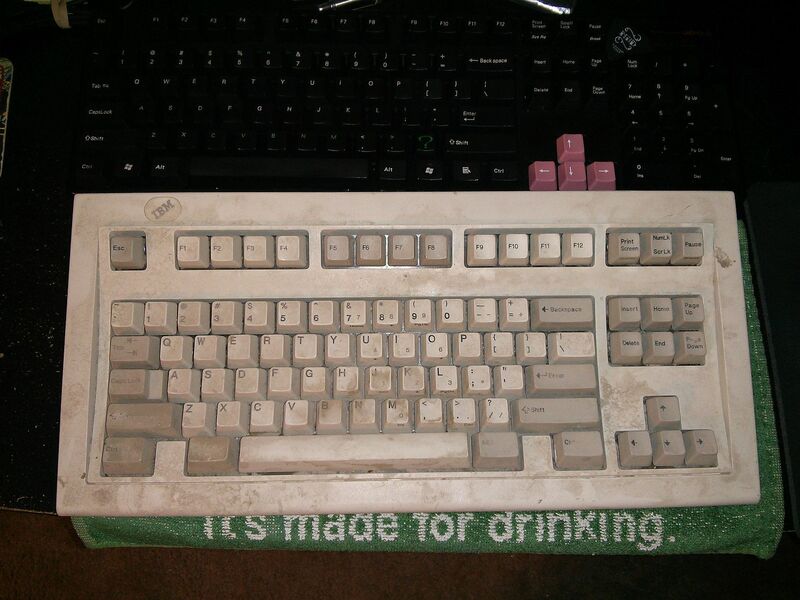 You'll be surprised at how well it cleans up: case, keycaps and all. Have you tested every key? The only thing holding this board back now is the membrane. Test every key before you bolt it back together with the new barrel plate so you know the membrane is good. It is possible to repair a broken membrane with the right copper tape, or conductive pen, but you'll want to know this before all the bolts are on. The bolt mod is notorious for not being right on the first try. Once it's done, if a key doesn't register, don't immediately assume that the membrane is to blame, adjust the tightness of the bolts. Too loose or too tight and some keys may stop working until it's adjusted. I tested the membrane through notepad and everything seems to be working fine. On my first bolt mod I ran into the issue of over tightening and switches not working and remember panicking a bit. 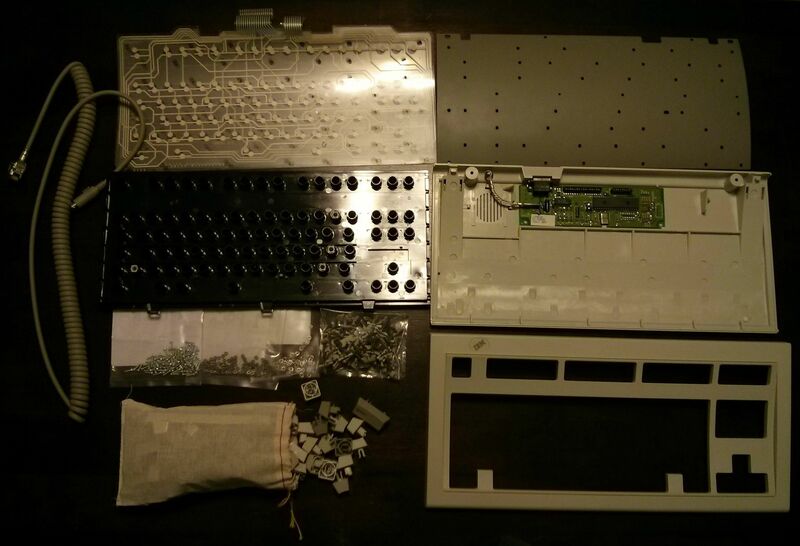 Me: Im rebuilding an ibm model m model 1391472 and am looking for a replacement frame. Will the 84-key frame you have work with my board? CSR: We don't have 84-key frames. Me: I was sure I saw them listed on your site. CSR: No you didn't. We don't carry those. Only 101 and 104. Me: If I were to cut down the 101 would it possibly fit? CSR: That I do not know. I can tell you that we are currently developing our own 84-key that you can get a hold of sometime middle of next year. Me: Excellent. Thank you very much. From there I went to the site and put in my order for the FR84 Frame that was listed, Cable, and the replacement pivots and springs, some extras of those. See if Mr. CSR or the site is lying/uninformed. Thanks again for your informative replies. They're really helping my confidence in saving this thing as well as learning some new things. Glad to be helpful! Hope they have the FR84 in stock. If not, I'm 99% certain that a 101 will work for the project, no matter what Unicomp says. Unicomp doesn't really get involved in the DIY scene, so they aren't aware of the things that can be done relatively easily with their parts. And wow. 84 key projected for mid 2014? Unicomp actually put an ETA on the project! Thank you! I put the order in. Hopefully it goes through. If not I may have to try cutting down a 101. Ready to go, will post an album and update possibly tomorrow. Thought about greasing the keys. Should I? Anyone else done this? Any recommendations on what type or brand? Thought about greasing the keys. Should I? 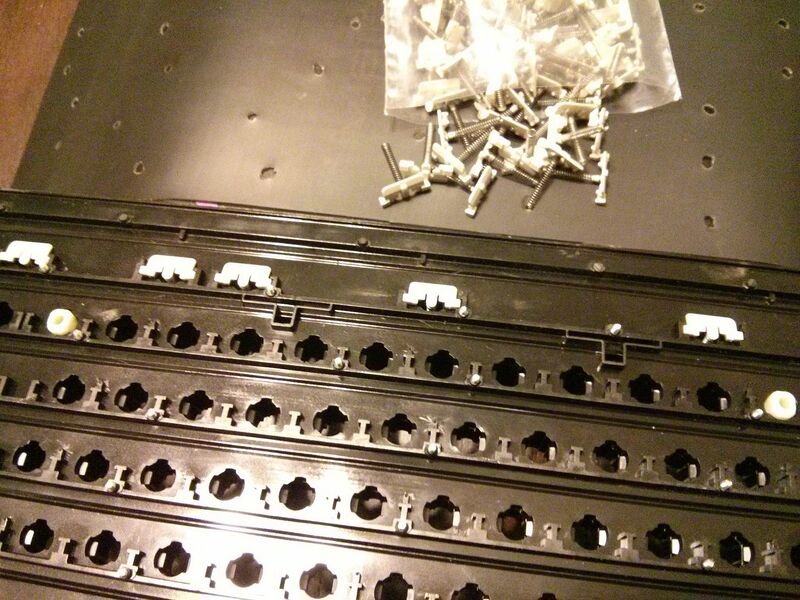 No, there is no point with buckling springs. 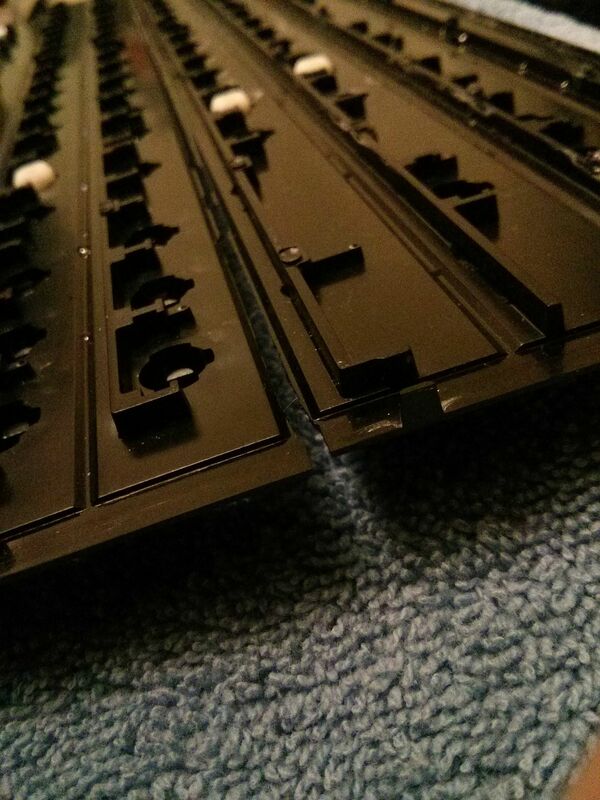 I do use a touch of stabilizer grease (from elitekeyboards) on the clips that hold the wires. 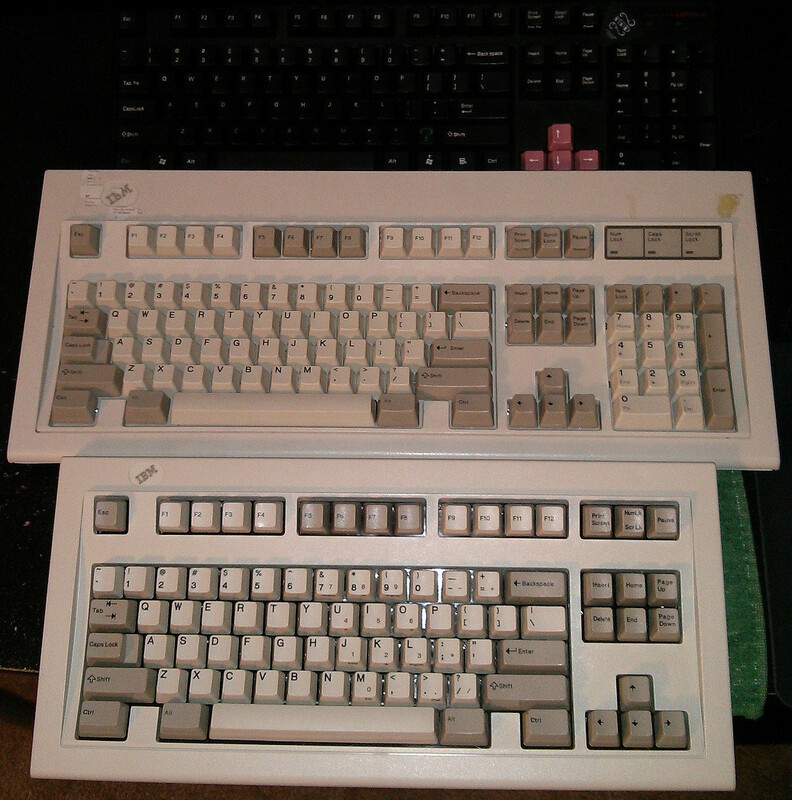 If you do decide you want to grease mod your Model M, rkinze has some info on it here. I recall liking the grease mod a lot and not the floss mod. I tried rkinze's grease modded M and floss modded M at Keycon. I recall liking the grease mod a lot and not the floss mod. Oh, "that" grease. Seems like a lot of work, and you have to be very careful. 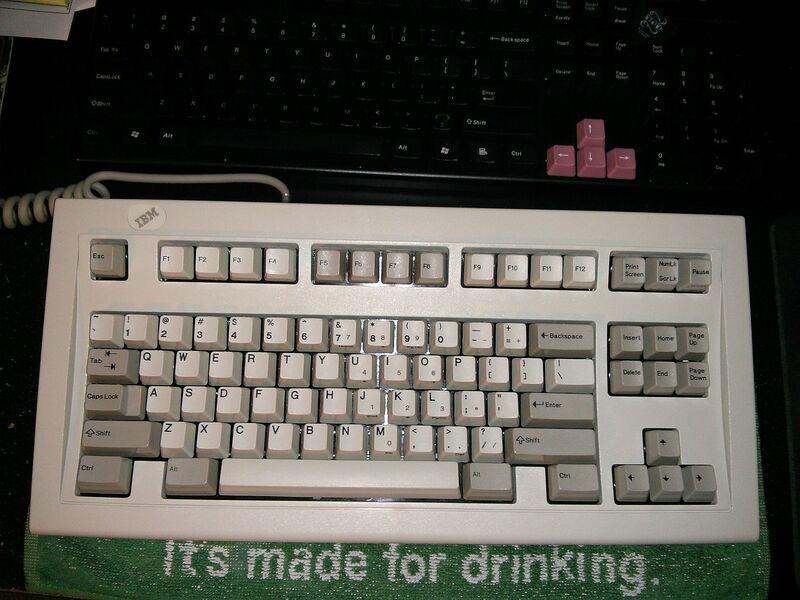 On the other hand, I once bought a really nice "non-working" Model M very cheap on ebay with a botched grease mod. It was pretty nasty on the inside. 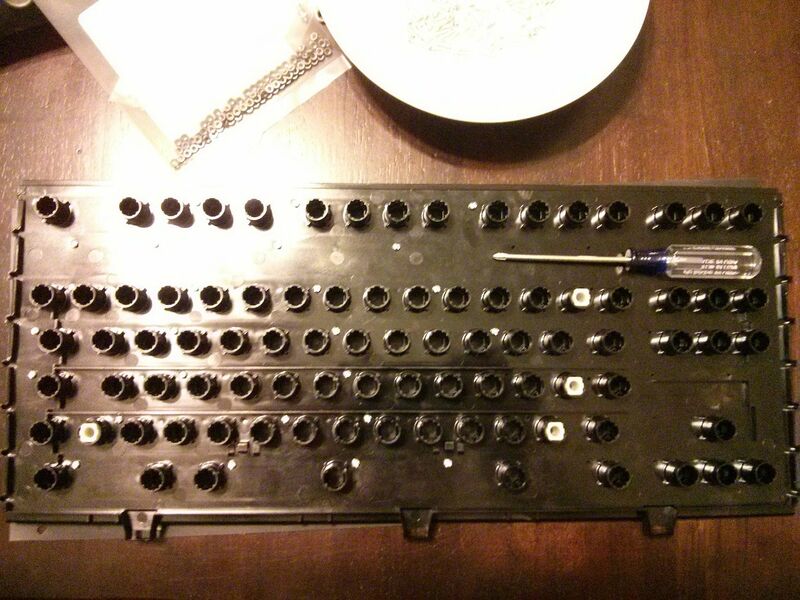 I simply threw the spring/hammers in the garbage and cleaned everything else with hot soapy water. Luckily, I have a big jar full of extra springs. What grease were you thinking of fohat.digs? When he said "grease the keys" I figured he meant the key stems, like lubing Cherries or Alps. I like the floss mod, its worked well enough for my work keyboard. I have found that the floss mod works better on the 1 piece BS keys than it does on the 2 piece cap-and-stem type. Good luck with your restoration!!! This is what I was referring to. After reading everyone's comments and checking that link I've decided against it. Doesn't seem to be worth the effort. I think I might pass on the floss mod. Something I've found cool about running my model M and all its noisy glory is eventually my gf requests I, "go back to the other, quieter board." Which is my MX blues. Here is the plate sanded down and ready for a bit of painting. Here is the back painted. I lost the tag that was on there. It didn't take well to being touched. Inside is black appliance epoxy. Here is the replacement frame and hammers/springs from Unicomp. Also the nuts and bolts. Not pictured is the new PS/2 Cable, again, Unicomp. 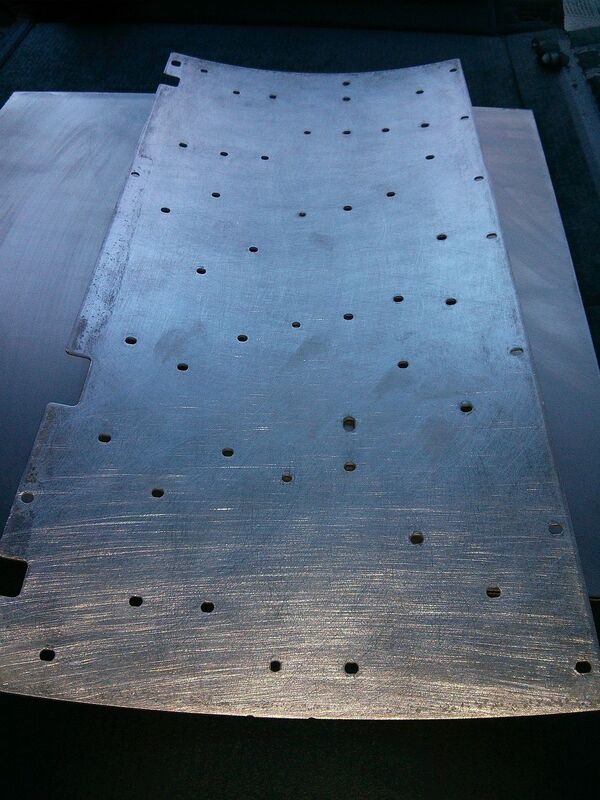 This is a .020" Polyurethane sheet I had to cut holes in to replace the original rubber mat. It still could be 1/2 to a 1/4 of the thickness but it works pretty well. Feels more crisp than my full M with its stock mat. 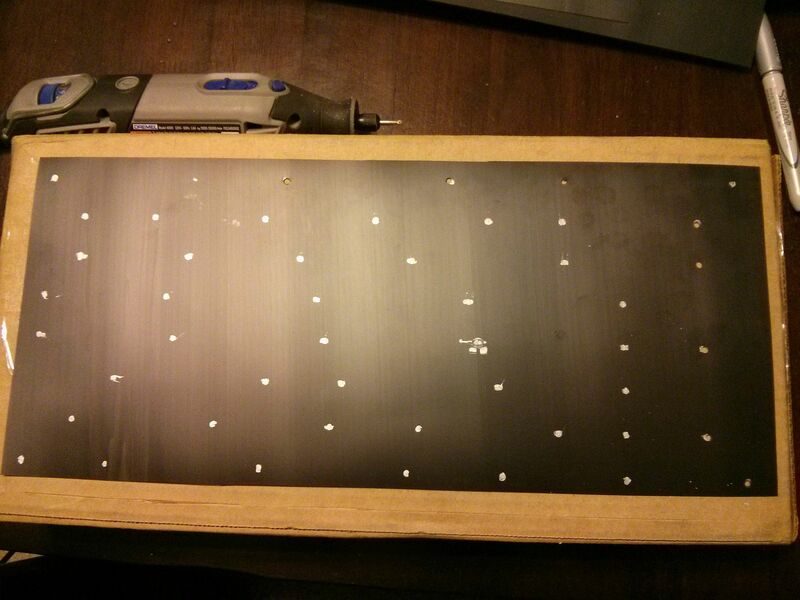 I had to cut the rivets down and then drill them. I did entertain the idea of trying to melt them down but figured I'd screw that up. Plus I don't have the tooling for that. More confident in clipping and drilling. Some fitting and modding of the holes on the new mat and it now lines up and lays flat. 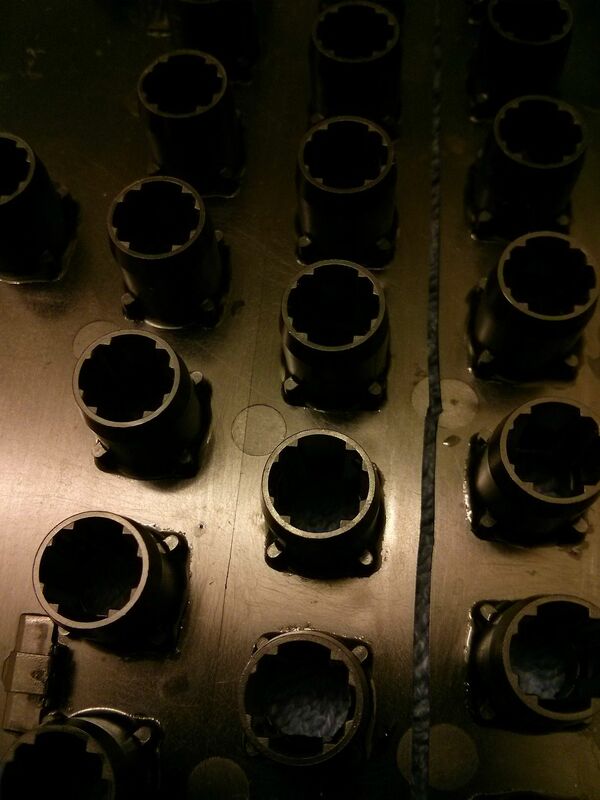 Drilling done and now ready to thread the screws in. Also, 5/32 wrench wasn't small enough for the nuts but worked. Need more metric tools. It felt like no matter how many I put in, there was still over half to go. Starting the hammers. I found they all have different numbers printed on them. I have no idea why, but I went ahead and put them in numeric order starting from Escape key and going top left to bottom right. Anyone know why they have different numbers? Range from G1-G62 on my handful. Mat and membranes fitted and lined up very well. Also if you notice on the leading edge of the frame I had removed the three prongs so it would fit in the case. Very happy with this replacement. From there started the task of placing the nuts while not letting the hammers lose their positions. 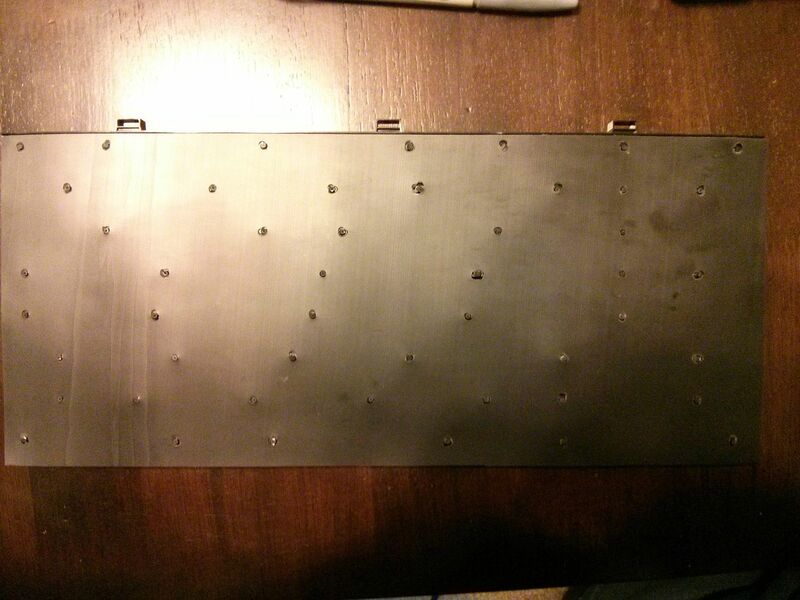 No pics of the back of the plate with all the nuts and bolts together. Forgot about that while making adjustments to the tightness around the back to get all the keys feeling as close as possible to one another. 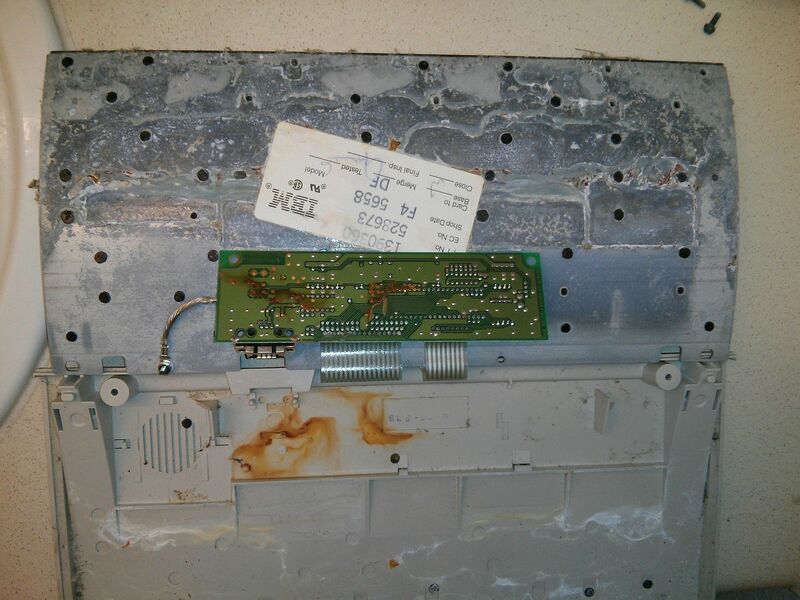 Also missing pics of the controller board cleaned up. Used some contact cleaner and a brush. Worked out pretty well. 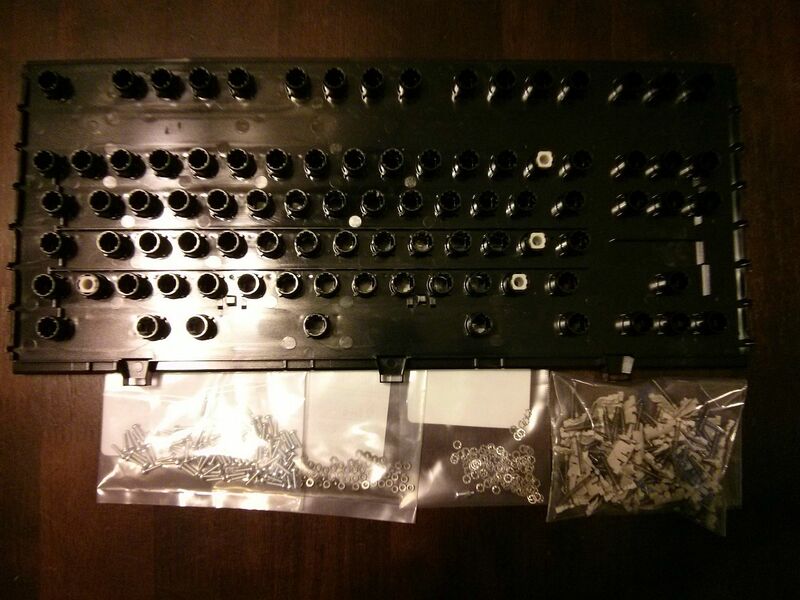 After complete reassembly and some key testing I found a couple keys not working. I removed the caps and placed them back on and they've been good. I think the spring wasn't in the key right because it was almost the feeling of a rubber dome which was very strange. All keys worked on Notepad and AquaKeyTest I wanted to not only see them light up in AKT but also see them fly up in notepad. Here is a final shot. One more with my FC500 and full M(which needs the case cleaned up better) Might give it another breakdown and apply some of my experience with this build. Feels very smooth and crisp, a bit better than my Full M. It lives, again! Thank you very much to all who viewed and/or replied in my thread and helped me along with information, tips and links. When I first opened this thing up and got into it I wasn't very confident in a full recovery. Another great learning experience and I hope to find more of these and bring them back to the desktop. Worst case you can sell it, might get $300 to $400. So, a split plastic plate cannot be repaired? It must be replaced? Thank you. I had some great help from fellow Geekhackers. Wow! Really? I put the value $100 tops. My concern with the plate was how brittle it was. Even laying it back to the back plate it starts crackling and exaggerating the existing cracks and forming new ones. It is now completely in two pieces ready to go into a third. I guess if I had known it was going to come apart like that I could have been a lot more delicate with it and maybe saved it but I'm still thinking during the drilling and bolting it would have cracked. Going with a new plate put a lot more confidence in the stability and longevity of the build. Cleaned and restored, with a new plate, definitely more than $100! Nice writeup of the restoration process. Very enjoyable read. Does make me worry about having to boltmod my own some day, seems like tedious work. I used a modern unicomp "blanket" which is much thinner. I like it a lot more than the original. Excellent writeup! Glad it worked out for you. Some of the odder things about this build are you have to cut some holes in the liquid drainage channels to get it to fit in the older case, but it's pretty easy. Glad you mentioned it! I recently bolted an M122. With a drill press and patience it was easy work. Very nicely done! Nice job on the rubber mat replacement too!